The latest image of the Sun from SOHO. To See more of the Sun Click here. Credit: NASA/ESA. While sidewalks crackle in the summer heat, NASA scientists are keeping a close eye on the sun. It is almost spotless, a sign that the Sun may have reached solar minimum. Scientists are now watching for the first spot of the new solar cycle to appear. The 11 year long solar cycle is marked by two extremes, solar minimum and solar maximum. 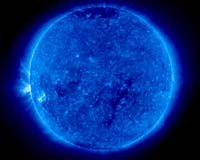 Solar minimum is the period of least solar activity in the solar cycle of the sun. During this time sunspot and solar flare activity diminishes, and often does not occur for days at a time. NOAA's Space Environment Center, Boulder CO, forecasts that the next solar cycle should begin in March 2008 and should peak in late 2011 or mid 2012.